We finally have a week where we are actually home for dinner most nights! Last week was a tough one for our family with lots of evening obligations. We did have a very nice weekend, though. I was able to get a nice menu planned for this week that includes some new recipes, and I baked 17 dozen chocolate chip cookies to stock the freezer! Yum! Last week's beef brisket ended up being disappointing. I cooked it for the length suggested, but it ended up way overdone. I will cook it for a shorter time next time. The Balsamic Barbeque Chicken was delicious, so we'll definitely be making that again. I have new recipes selected for Monday - Thursday this week, so be sure to check back for photos as I make them. For more menu ideas, visit orgjunkie.com. Enjoy and have a great week! These were really tasty fries. My son absolutely loved them. 2.Cook on parchment paper, and spray it with cooking spray. 3.Combine all dry ingredients and combine with potatoes, tossing to coat. 4.Drizzle with oil, tossing again to coat. 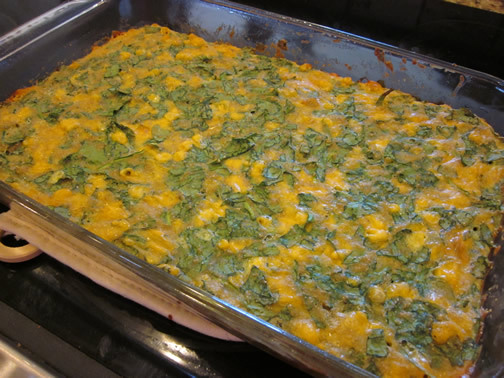 5.Arrange potatoes in a single layer on baking sheet and bake for 35 minutes or until golden brown. 1. Preheat oven to 425°. Prepare rice according to package directions. greased 11 x 7 inch baking dish. Sprinkle with cheese and breadcrumbs. 5 minutes before serving. Garnish, if desired. Brown hamburger. Mix green beans, hamburger, soup and milk together. Place in the bottom of a casserole dish. 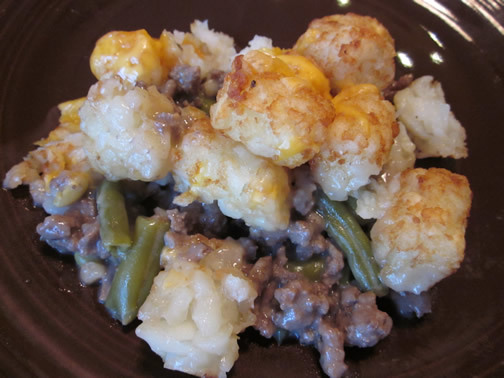 Cover the top of the hamburger mixture with a layer of tater tots. Bake at 375 degrees for 50 minutes. Remove and sprinkle cheese over the top. Place back in the oven and bake for 10 more minutes or until the cheese is melted. Heat oven to 350°F. Spray cookie sheet with nonstick cooking spray. 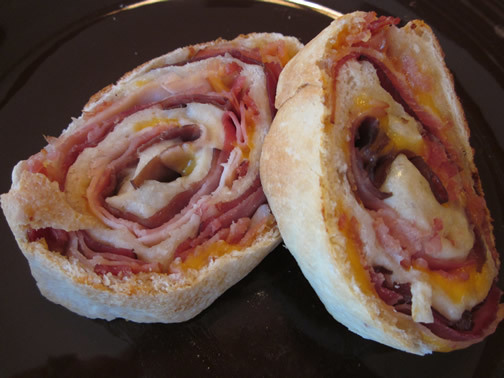 Unroll dough. Sprinkle cheese over dough. Top with turkey, ham, roast beef and bacon. Starting with long side, roll up dough; press edges to seal. Make 3 to 4 slits in top of loaf. Place on sprayed cookie sheet. Bake at 350°F. for 23 to 28 minutes or until golden brown. Cool 5 minutes. Cut into 1-inch diagonal slices. This was really tasty and really easy to make. I made it the day before and just put it in the oven the night we wanted to eat it. In a large bowl, combine the corn bread, egg and milk until blended. Spread into an 8 x 8 pan sprayed with cooking spray. Bake at 350 for 15 minutes. 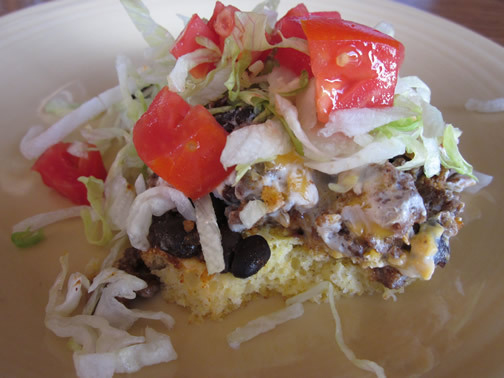 Combine taco meat and beans, spread over corn bread. Combine sour cream, cheese and onion. Spread over meat mixture. Bake for 20 - 25 minutes longer or until heated through and cheese is melted. Sprinkle with tomato and lettuce. We survived the first week back to school! I had a great time seeing the students' reactions to my library rearranging and decorations. They love that I put a canoe in the library this year. The camping theme our school selected was a great one for me. 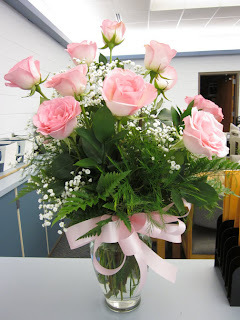 :) I got a nice surprise on Tuesday when my hubby delivered roses to me just because he loves me! What a man! Here is my menu for the week. There are a couple of new items, so we'll see how they go. For more ideas go to orgjunkie.com. Enjoy and have a great week! 1. Beat the butter and sugar together in a mixing until creamed, about 2-3 minutes. Add egg and beat until well combined. 2. In a small bowl, stir together the flour, baking powder and salt. In a second small bowl or measuring cup, combine the sour cream and vanilla. Add half the flour and half the sour cream mixture to the mixing bowl and stir just until combined. Repeat with the remaining flour and sour cream, being careful not to over mix. 3. Grease and flour a muffin tin, or line with baking cups. Fill muffin cups 1/3 full with the batter. 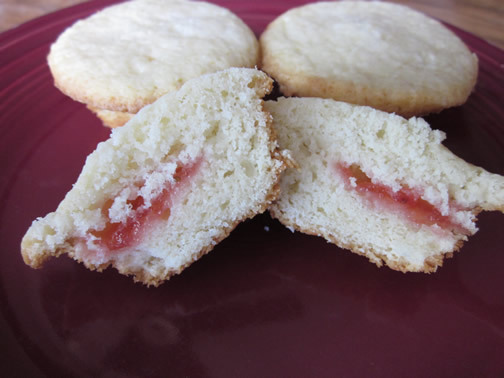 Add a dollop of jam or preserves on top of the batter and then top with remaining muffin batter. 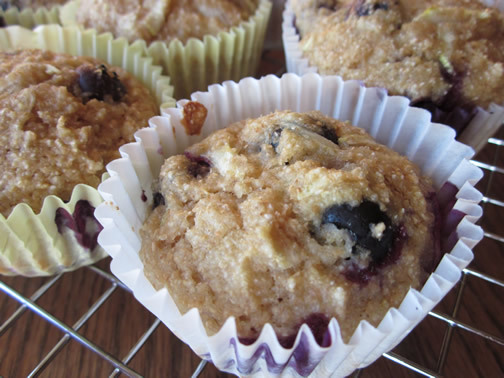 Sprinkle additional sugar over the tops of the muffins, if desired, for a crispy muffin top. 4. Bake at 350 degrees for about 15-20 minutes for mini muffins or 20-25 minutes for regular sized muffins. In a large bowl with an electric mixer, cream the cream cheese and butter until smooth. Add the egg. Then beat in the Nutella and vanilla extract. Mix in the cake mix. Cover and refrigerate for 2 hours to firm up so that you can roll the batter into balls. Roll the chilled batter into tablespoon sized balls (I used a medium cookie scoop) and then roll them in powdered sugar. Place on an cookie sheet lined with parchment. Bake 12-14 minutes. 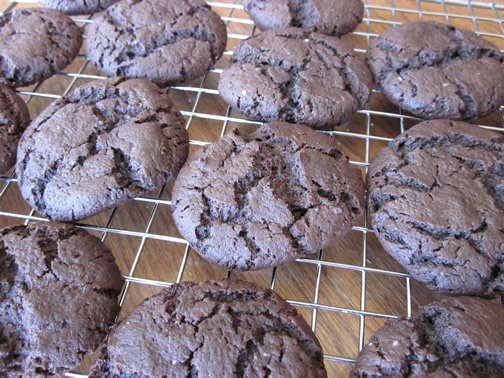 The cookies will remain soft and gooey. Makes about 4 dozen cookies. Begin by shredding the zucchini, drain excess liquid by squeezing zucchini shreds in a cheesecloth or paper towels. Then, mix together the dry ingredients in a separate bowl. 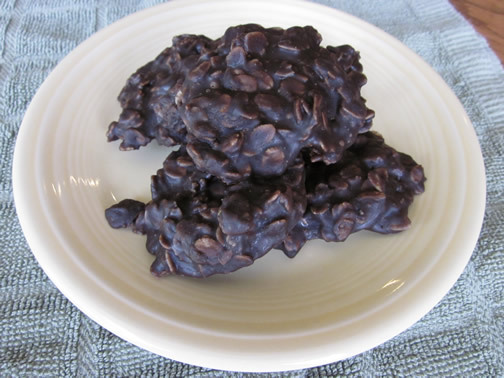 Combine the moist ingredients together, and then add these to the dry ingredients. Stir until just moist. Then, add in the zucchini. Carefully fold in the blueberries. Scoop into muffin tins, filling about 3/4 of the way full. This made 12 regular muffins. Bake at 375 for 15-20 minutes, until golden brown. In large bowl, combine oil and/or applesauce, sugars, egg and vanilla. Stir in zucchini to combine. Add flour, salt, baking powder and soda, cinnamon and fold ingredients until just barely combined. Place into loaf pan(s) and top with raw sugar. Place in center of oven to bake until toothpick inserted into center comes out clean, about 60-75 minutes for loaf pan and 35-40 minutes for miniature loaf pans. Let cool in pans for 15 minutes and remove to let cool completely before slicing and serving. Preheat oven to 375 degrees. 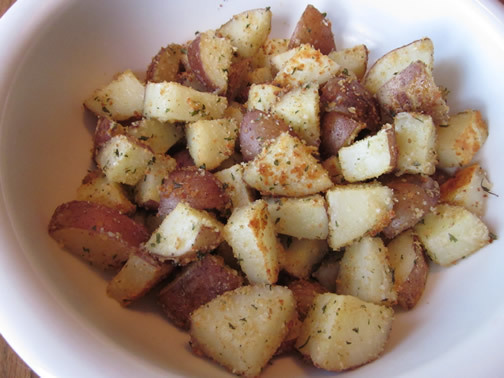 Slice potatoes into wedges and place in bowl. Toss in olive oil until coated and then add all remaining ingredients and toss until evenly coated. 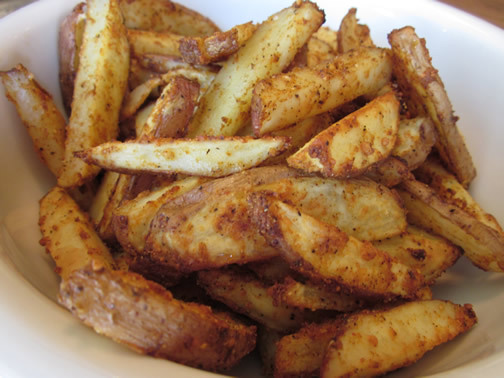 Bake in preheated oven 30-40 minutes or until desired degree of crispness, turning wedges over halfway through baking. Mix soy sauce, lemon juice, garlic and beef broth together in a medium bowl. Place brisket in a large container or Ziploc bag and pour marinade over. Refrigerate overnight. 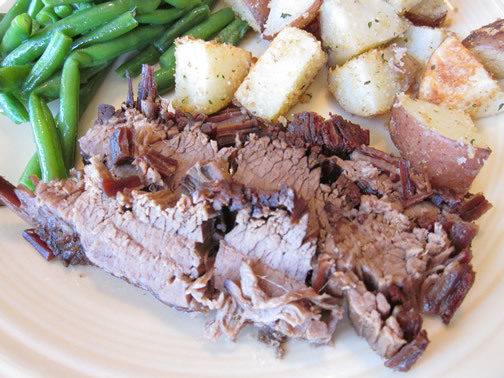 Pour off marinade and wrap the brisket in three or four layers of heavy duty aluminum foil; place in a roasting pan. Cook at 325 degrees for 5 hours, or alternately, at 275 degrees for 6 hours. Serve with the pan juices or BBQ sauce. (I went with the lower temperature and longer cooking time). The picture is what they look like when you put them in the freezer before they are cooked. Mix dry ingredients in a bowl. Cut in butter until there are small well blended pieces. Add sour cream and water, mix well. Knead and roll out to 1 inch thick. Cut with biscuit cutter. Freeze individually on a cookie sheet. When frozen solid, place in a freezer bag to store. 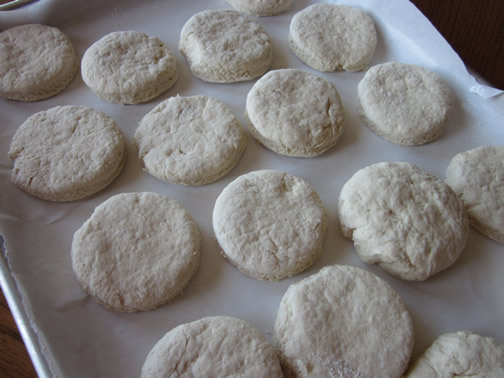 When ready to use, place frozen biscuits on ungreased cookie sheet. Bake at 425 for 15-17 minutes or until top is golden. Makes 16-20. 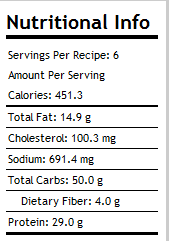 When I followed this recipe, I must have used way too much spinach. It calls for 8 oz. of spinach, and I bought a 10 oz. bag of fresh spinach. 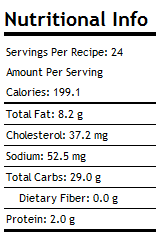 I put in what I guessed was 8 oz, but once I put it in the batter, there was no more batter! So, I doubled the batter part of the mixture and it seemed a little better. I cooked it in a 9 x 13 pan. Unfortunately, they ended up tasting horrible, so I won't be making them again. In a large bowl, mix together the flour and baking powder. Then, make a well in the center of the flour and crack the eggs. Add in the milk and mix well. Next, stir in the spinach. Then, add in the cheese. Pour into a greased 9x9 glass baking dish. Bake at 350 for 40ish minutes, until a knife inserted into the center comes out clean. Mix ingredients together. Reserve 3/4 cup and refrigerate. 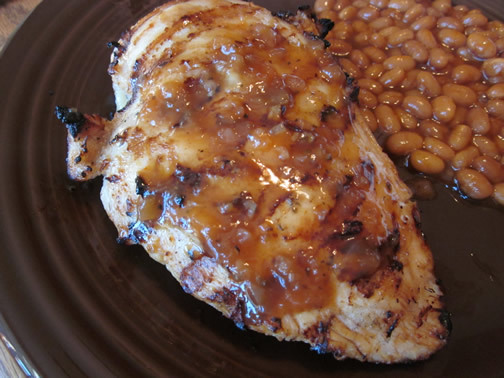 Pour remaining sauce over chicken and marinate 4-24 hours. (The longer you marinate, the better flavor you get.) Remove chicken from marinade and bake, broil or grill it. When chicken is cooked thoroughly, heat up reserved sauce and pour over top of chicken. *Add the sugar according to your tastes. I have noticed that some Balsamic Vinaigrettes are more sweet than others so you don't need as much. 1. In a large bowl, whisk together the flour, sugar, baking powder and salt until combined. Stir in the chocolate chips. 2. In a second bowl, combine the remaining ingredients and whisk until fully combined. Pour the wet ingredients into the dry ingredients and stir just until everything is moistened and combined. Be careful not to over-stir. Recipe makes 40 mini muffins and 6 regular sized or about 1 1/2 - 2 dozen regular sized muffins. Well, this is another week that probably won't be very helpful to others. We start back to school this week. Teachers start Monday with meetings and inservice, and students start on Thursday. For our family, this is going to pose a few extra challenges meal-wise because my son still has cross country practice early in the morning and band practice until late at night until Wednesday. So, you won't see a normal meal plan for our family this week. Hopefully things will slow down a bit soon so we can eat a little better. :) I do promise to have more useful menus and new recipes soon! For more menu ideas, go to orgjunkie.com. Have a great week! This is going to be a short and sweet post. I am back at school this week, and because of Corey's band and cross country practices, we are at school for 14 hours a day. Yuck! Therefore, we needed to bring both lunch and dinner with us this week. Sorry for the boring menu, but we are in total survival mode this week. 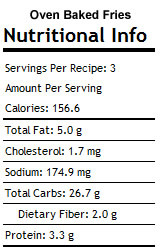 For more menu ideas, go to orgjunkie.com. Here's this week's menu. In a heavy saucepan bring to a boil the sugar, cocoa, butter and milk. Let boil for 1 minute (very important to do this step so they set up correctly) then add peanut butter, vanilla and oatmeal. On a sheet of waxed paper, drop mixture by teaspoonfuls. Let them rest until cooled and hardened. The countdown to the first day of school continues. Last week was filled with computer workshops for me and band practice for Corey. This week is the week to get all of our medical appointments taken care of. Every day this week is spent at either the dentist, orthodontist, or misc. medical procedures for me. :( Oh well, at least we are able to get this stuff out of the way and won't have to miss school. Because of being out of commission a couple of days, you will see that I have planned pretty easy meals. Here is this week's menu. For more menu ideas go to orgjunkie.com. Have a great week and enjoy! 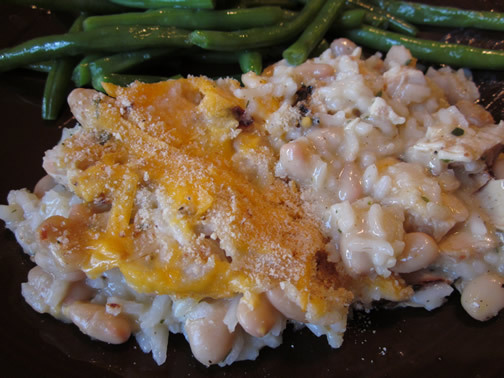 Welcome to Cindy's Recipes, my online collection of the food I cook for my family! I hope that by sharing my favorite recipes and meal plans that I can make cooking easier and more enjoyable to others.